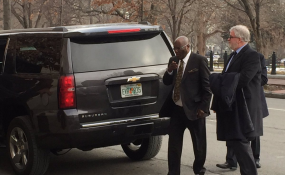 The presidential candidate of the Peoples Democratic Party (PDP), Alhaji Atiku Abubakar, has arrived Washington DC on a visit to the United States, the first time in over one decade. The former vice president was accompanied by Senate President Bukola Saraki and Director General of his campaign, former governor Gbenga Daniel. Atiku, in a tweet on Thursday night, said "Just arrived Washington DC for a meeting with US government officials, Nigerians living in DC metropolis and the business community. - AA"
Also a statement by his media aide, Paul Ibe, said Atiku arrived the United States at 20.20 hours (14.20 hours Washington DC time). Ibe said that Atiku on Wednesday met with the business community in Lagos at an interactive session to unveil his plans to get Nigeria working again. According to him, "Thursday morning, he left Abuja accompanied by the DG of PDP Presidential Campaign Organisation and Senate President, Sen. Bukola Saraki for the United States." "Atiku will in the course of his trip hold meeting with US government officials, the business community and the Nigerian community. He will return to the country on Saturday," Ibe added. Atiku had been unable to visit the United States since he left office as Nigeria's vice president in 2007 because the US government did not grant him entry visa. The former vice president had in an interview in 2017 said: "I applied, but wasn't issued a visa. However, they did not decline me categorically either. They've only said my application is going through administrative process." "It is the sole prerogative of America to determine who they want in their country or not. I'm not running away from America." After he emerged the presidential candidate of Nigeria's major opposition party, Atiku reapplied for US visa and was granted, thus enabling him to make the trip to Washington Thursday.